Why is this shirt worth buying? Fair question! This shirt is worth buying first and foremost because it is so full of style and oozes coolness! Your computer or telephone pixel image does not give this shirt the day in court is truly deserves! You have to see this shirt in person to truly appreciate the quality of the fabric and buttons used in the making of this article of clothing. This garment is made of 100% Kona cotton fabric. Kona cotton is a type of cotton fabric that was originally created for the quilting market. Kona cotton is the choice of fabric for this shirt because Kona cotton is made from a select grade of cotton fiber given a high thread count and tight weave in the manufacturing process. The tight weave and great cotton fibers used to make this fabric mean that Kona cotton is unusually strong and durable compared to other cotton cloth of the same weight. Kona cotton is also made using the most non-allergenic and non-toxic dyes available. Kona cotton is approved for use in bedding materials for babies. Low quality garments sold at big box stores are made of fabrics dyed with toxic chemicals that continue to leach lead, mercury, and other toxic heavy metals into the skin of people wearing these articles of clothing. Besides poisoning people wearing the poisoned dye clothing, these fabrics eventually wind up in landfills leaching toxins into ground water and eventually damaging the entire local ecosystem. A shirt such as this one made from Kona cotton is a great find for those with allergies or skin sensitivities. A shirt made of Kona cotton is a great investment and should last a bit longer than a shirt made of a lower grade of cotton. 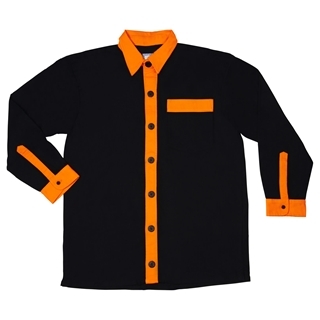 The buttons used to make this shirt are sourced from Germany and are still primarily sold in the art project sewing market. Each shirt color variation in the All Occasions dress shirt line has its own style of buttons, as does this shirt. The wholesale cost of the fabric alone when making this shirt is about what a cheap men’s dress shirt would cost at a discount big box retailer. The better components used to make this shirt mean that the final price cannot be all that cheap. Think of this shirt as a good long term investment. Besides being cool and stylish and made of great materials, this shirt is sewn together in the USA and a purchase of this shirt helps to support American industry and provide jobs for Americans. We at Quantum Cat Designs are still committed to keeping our production in the US of A. America is still classified by economists as a wealthy nation, however; there are still plenty of Americans these days who are struggling financially who would appreciate your support. Style Points: Stylistically this shirt has a bit of sizzle. This design has a nice mellow and summery vibe to it. This shirt is a great find for sitting in a nice café in the summer months or enjoying a nice brunch out with friends and family in the spring. This shirt is still a good fit for office work because it has a bit of spice, but is not so bold as to appear out of place in office settings. This shirt also provides a good balance of spice and subtlety for night outings.